The curriculum utilized at Play Groups is guided by the established principles of The Creative Curriculum®, widely regarded as one of the nation’s leading systems of integrated planning, assessment and evaluation for early childhood programs. The natural environment of the Outdoor Classroom offers Play Groups children a vast new world of opportunities to enhance and expand the development of their cognitive, emotional, social and physical skills. Developed as children share ideas, make decisions, negotiate, agree on tasks and problem-solve together with teacher support and modeling. 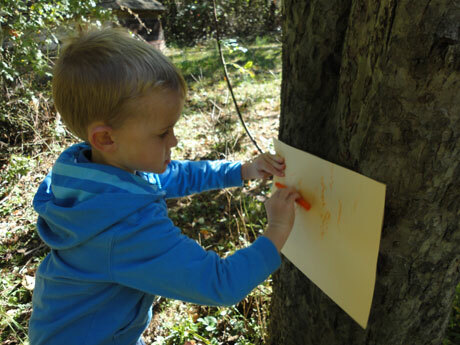 Inspired through the introduction of new vocabulary, writing signs for the garden, creating poetry, dramatic storytelling and noting observations through print and drawings in a nature journal. 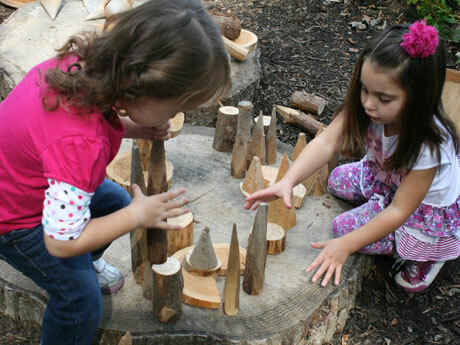 Include counting, predicting and estimating as children collect pinecones or build a house. As children explore measurement concepts such as length, area, perimeter and volume, the groundwork is being laid for later high-level work in subjects such as geometry. Include classifying objects into groups with common characteristics, predicting, experimenting and drawing conclusions. Hands-on learning occurs as children directly experience life cycles, seasons and decomposition. Children develop a sense of wonder and appreciation for the world around them as they help care for living things. Enhanced by learning to negotiate well in space and to follow maps and design buildings. These skills are developed as children climb, build and look at the world from multiple perspectives. Developed through the use of a variety of musical instruments that demonstrate sound, pitch, rhythm and tonality. Children experiment with natural materials to create their own music and sounds, cultivating improvisation and creativity. Developed when children translate what they see, hear and feel into two- and three-dimensional art using natural materials.